4-6h of direct light exposure required before sunset. Much of the light is released back out within the first 2 hours (this is when they are at their brightest) and then the rocks retain a softer, ambient glow for another 6h. Place them in a location that is open to the late afternoon sun. (For example, the south side of your yard) If your backyard is exposed to the morning or mid-day sun only, the exposure to direct sunlight stops and the rocks begin to release the glow already, which goes unnoticed because of the presence of daylight. If the location of your yard is not ideal for maximum sunlight exposure, then you can incorporate flood lights or landscape lighting to activate the rocks at night. Direct light exposure will activate the rocks within a few minutes, but 4-6h of light exposure is ideal. These rocks do great with indoor placement - on flower pots, or in an aquarium, or on your night stand - as long as they are exposed to artificial light after dark. Regular living room lights will do. Once you switch off all the lights in the room, you will be mesmerized by the luminous, magical glow. It is normal for pebbles to float when first placed in water. They can be grounded simply by pushing them back down, or using gravel or sand, without affecting the glow. IMAGE NOTE: Aquarium/Fish Tank images contain 1 packs of pebbles, or 24 pebbles total. ▸ LARGE SIZE: SapphrGlo glow in the dark stones are larger than other glow stones for outdoor use, with sizing in the 3-6cm range (1.2-2.4 inches). The larger size allows for more of a wonderous, luminous glow that can be seen from a much farther distance than tinier glow in the dark garden pebbles, glowing aquarium rocks and similar plastic pebbles. 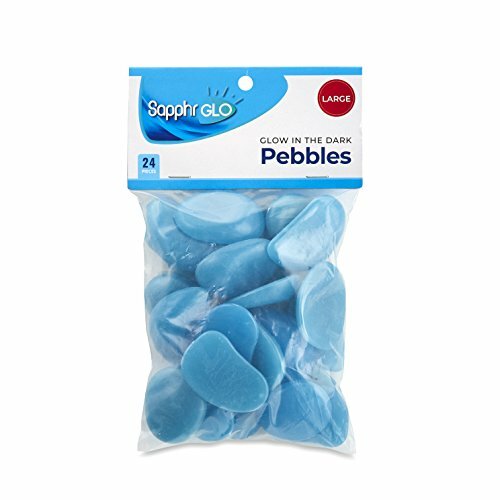 ▸ EXTRA VERSATILE : SapphrGlo luminous pebbles/glow stones are heavier and larger than the tinier glow in dark stones in the market; they weigh ~13g each. Their size makes for great glow in the dark aquarium pebbles, rocks for fish tanks, and beta fish decor. They can also be used as glowing garden stones, glow rocks for outdoor use or as decorative rocks for potted plants indoors. ▸ VISIBLE COLOR, NON TOXIC: SapphrGlo plastic glow pebbles serve as colored accent stones during daytime, while glowing in those spaces at night. They have a rounded shape on top that resembles pebbles for plants or fish tank rocks. Some pebbles have a flat bottom, while others have a rounded bottom. They have visible lines on the surface owing to how they are made. Each glow stone is made of plastic polystyrene resin, and is non-toxic to plant life, birds, fish, or to the human skin. ▸ 100% MONEY-BACK GUARANTEE: SapphrGlo plastic glow pebbles are backed by 100% guarantee that you are fully satisfied with your product or receive your money back. ▸ SAVE WITH 24 PIECES IN A PACK: SapphrGlo glow rocks now come in 24 pieces a bag, in a sturdy polybag and branded header card. Each package weighs ~300g. The pieces come in 1 color per bag - in blue or green - so that you don't have to separate them after the fact. If you don't see the SapphrGlo logo on our packaging, then you have been sold inauthentic product! If you have any questions about this product by SapphrGlo, contact us by completing and submitting the form below. If you are looking for a specif part number, please include it with your message.